Want To Make Coffee Like Your Favorite Coffee Shop? 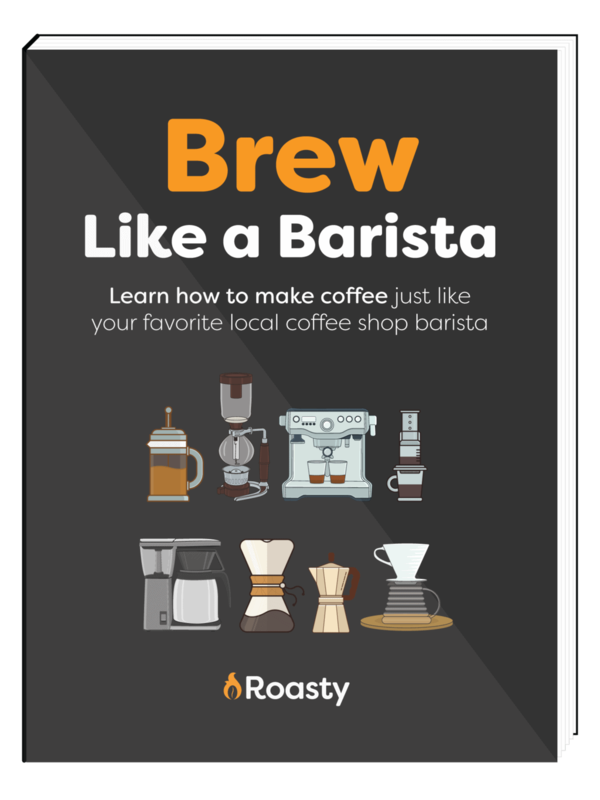 Download our FREE guide to learn how to brew coffee like a barista at your favorite coffee shop. Just enter your email address to download the guide today! Sign up for a free newsletter to help you brew amazing coffee at home. CLICK HERE to subscribe to our weekly emails on finding and brewing amazing coffee! Do you love coffee and look forward to enjoying a cup, but you wish that you had a better appreciation for the multitude of subtle taste differences and experiences? Then you need to develop a more refined coffee palate. A person’s appreciation of taste and flavor, especially when sophisticated and discriminating. Quite simply, a coffee palate is the ability to taste the differences between different roasts, origins, and flavors of coffee. When you have a well-exercised palate, you can detect even the smallest hint of flavor and body in each cup of coffee. This greatly enhances the flavors that you experience. As you continue to drink (and think about) coffee, you can develop your own sophisticated palate that will rival the “experts.” Coffee professionals don’t have special spoons or fancy brewers, they simply have more opportunities for comparative tasting. Our ability to smell greatly impacts our sense of taste. Before you begin to do your taste testing, be sure your nose is free and clear, and you can breathe and smell everything around you easily. The coffee bean that we roast is actually the seed of a fruit, similar to a cherry. Because of this, many coffees include a floral or more fruit-like aroma to them. These aromas are described as enzymatic properties that may remind you of the original plant life state that the coffee bean came from. These aromas can vary greatly, from berry-like to citrus, and even oniony and melony. For example, many coffees from Latin America have a sweeter berry aroma to them, while coffees from Kenya smell a little tart. How many different enzymatic properties can you detect in your coffee’s aroma? This category refers to a chemical reaction that occurs when amino acids and sugars are exposed to heat. These aromas will often remind you of toasted nuts or maybe even cocoa. Some of these smells may even fool you into thinking there are pastries being baked. Different coffees produce different levels of sugar browning, but more than likely you will be able to detect it. The question is, what kind of sugar browning aroma does your coffee produce? During the coffee roasting, the fibrous bean material is literally burned in the roaster. This brings its own unique aromas that will remind you of wood or maybe pipe tobacco. Some coffees even give off a clove or leather smell. These aromas are referred to dry distillation as the roasting process is what creates these unique scents. Dry distillation scents become even stronger when the beans are from a darker roast. These roasts take longer than lighter roasts meaning there is more time for these scents to be burned into the beans. Many find these rather unpleasant and consider them a burnt smell. But try not to look at that way and associate it with pleasant aromas in your life. The folks over at the Specialty Coffee Association of America have developed a coffee taste wheel that you see above, which can help you describe how each cup of coffee tastes. This can be a great reference while you practice on your own. I recommend practicing both with and without it on your journey toward developing a truly sensitive coffee palate. That way you can begin to formulate exactly how a coffee tastes to you while also understanding how many coffee professionals refer to the different taste experiences offered by some of the world’s best coffee. After awhile, you will find that you are better able to discern the differences between each cup of coffee that you drink pointing out different aspects of what makes that cup of coffee special from all the rest. With a little effort, you will find that you are better able to appreciate and enjoy each cup of coffee you drink and as your coffee palate continues to develop, you will soon rise to the level of many coffee professionals. This is primarily a tasting glossary and not a complete glossary covering every term used when discussing coffee. Let’s take a look at many of the most commonly used coffee tasting terms that will help you keep up with the conversation when it turns to coffee. Acrid – A harsh, sour taste often described as tart or sharp. Ashy – A type of coffee aroma usually found in dark roast coffee. This aroma gives off a fragrance that is reminiscent of the smell of an ashtray or fireplace. Baggy – Refers to coffee that has been stored too long or light roasted coffees with qualities that remind the taster of mildew. Baked – Coffee that is flat, dull and very boring. Bitter – A harsh, sour and even unpleasant taste that is noticed mostly in the back of the tongue. Bouquet – The aroma of coffee that has been freshly ground. Bready – Coffee with a grain-like aroma that reminds one of bread. Usually found in sour tasting coffee or coffee beans that have not been sufficiently roasted. Bright – Refers to pleasant tasting coffee with a tangy flavor. Briny – A slightly salty taste in coffee that is caused by reheating or by coffee that has been left on a burner for too long. Caramelly – A flavor or aroma that resembles candy or syrup such as sugars that have been caramelized. Carbony – A flavor or aroma that has the characteristics of burnt food or wood. These flavors usually accompany darker roasted coffees. Chicory – An herb used to flavor coffee or even as a coffee substitute. Chocolatey – A flavor or aroma that resembles chocolate. Citrusy – A flavor or aroma of citrus fruit. This can often be found in coffee as coffee beans come from the cherries of coffee. Earthy – An aroma of fresh earth or wet soil. Can be considered both good or bad but sometimes refers to the presence of different types of mold. Ferment – A sour or oniony taste from coffee that has been allowed to sit and ferment for longer than is necessary. Floral – An aroma of fresh flowers that can often be found in coffees with a fruity or herbal flavor or aroma. Fruity – An aroma and taste that resembles different types of fruits. Grassy – An aroma that reminds one of mown grass that is usually associated with beans that have been under roasted or damaged by water. Herbal – Refers to an aroma of freshly mown grass and herbs and is found in coffee that has not been fully dried when it is processed. Hidey – Refers to an aroma or taste that resembles leather. Often found in some east African coffees. Malty – An aroma of malt or grain similar to the aromas of freshly baked bread. Mellow – A balanced and mild coffee that doesn’t have any strong tastes or aromas. Nutty – An aroma resembling fresh nuts. This term is only used when recalling fresh nuts and not bitter or spoiled nuts. Oniony – A flavor that reminds one of onions. It is often found when stagnate water is used for processing using the wet method. Papery – A taste that results from storing coffee in paper bags or prepared using a low quality filter paper. Quakery – A flavor that reminds one of peanuts resulting from using unripe coffee beans. Rubbery – An aroma or characteristic found in fresh Robustas that refers to the taste and smell of hot tires or rubber bands. Scorched – Coffee that has been roasted until it receives burn marks due to roasting too hot or poor tumbling during the process. Sour – A biting and unpleasant flavor found in coffee. Spicy – A taste or aroma that resembles cloves, cinnamon or other spices. Tobacco – The aroma and flavor of fresh tobacco. Not always negative and can be found in many coffees around the world. Winey – A combination of taste, smell and feel in the mouth of coffee that resembles that of wine. Woody – A taste and smell of old coffee. 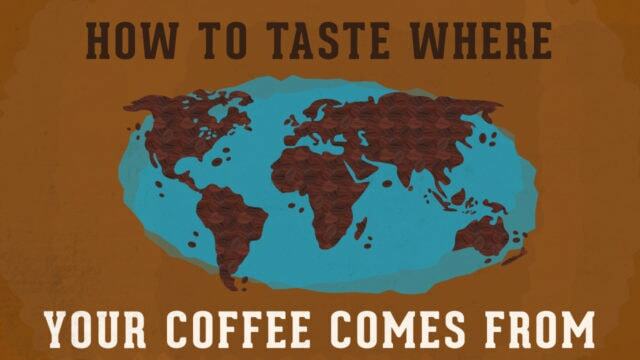 Each major area of coffee production brings its own unique flavors to the world of coffee, and experienced coffee cuppers can identify the region just by taking a sip. You can, too, with a little practice. Before we examine each region, let’s stop for a second to take a look at the three main factors that influence the taste of coffee. Type of Coffee – The two main species are Arabica and Robusta. Where It’s Grown – Different areas have different climates and make use of different growth processes. These factors impact the overall flavor of the coffee just like any crop. How It’s Processed – After coffee is harvested, it’s processed (washed or natural) and roasted. There are many different processes out there for preparing the coffee and they can vary greatly from region to region. Let’s take a closer look at several of the major regions of coffee production and some of the unique coffee tastes you will find from these regions. Central America is a large contributor to the coffee supply, particular here in the Americas. A majority of the coffee you find here in the States comes from Central America, and it has greatly shaped the coffee tastes of millions of Americans. Because of the growth and processing techniques, most of these coffees have a degree of acidity to them, much like an apple, while still including a sweetness that will remind you of a soft chocolate or pastry. You may still detect a hint of fruitiness as well, although that taste is more a backdrop and there to compliment the other flavors. In most cases, when we talk South America, we really mean Columbian coffees. After all, they are one of the biggest contributors from that continent. Though you will find other countries that produce even better quality coffees than Columbia. In most cases, you will find that Columbian and other coffees from South America will be less acidic but include a caramel sweetness and a nutty undertone that can’t be beaten. You may be wondering why Brazil isn’t included in South America. The reason is two-fold. First, they are a huge producer, and second, their flavors vary from the rest of the continent. The Brazil natural coffee, as it has come to be known, has a strong nut flavor to it compared to other coffees from South America. These coffees even have a hint of chocolate to them and tend to linger in your mouth, making them great options for espresso blends. This coffee can be a bit trickier to identify. You see, in Ethiopia, there are more species of coffee grown than anywhere else. Many of them are wild species that haven’t even ben cataloged. They also use two different processes for preparing the coffee. In the first, “natural process,” the cherry is dried around the bean before being removed. The second, “washed process,” sees the fruit get stripped as soon as 12 hours after being picked. The naturally processed coffees tend to have a very berry flavor that may even remind you of a strawberry or blueberry. However, the washed coffee tends to give you a hint of jasmine or lemongrass and are often drier and lighter on your palate. Coffees produced in Kenya are grown in areas without shade, and the processing uses a post fermentation soak that can last over a day. This results in a sweet flavor characteristic to the coffees. In some cases, this results in a more tomato-like acidity, while in other cases a tartness that you will detect immediately. It’s a tropical taste that many coffee experts admit is their favorite. Indonesian coffees are yet another that are impacted by the climate and the processing used to prepare the coffee. Often these coffees are very dark and have a meaty earthiness to them when tasted. In some cases, you will also note smoky and toasted flavors present as well. Cupping: it’s not just for presumptuous tailors. A good coffee cupping session deepens your understanding and appreciation of the subtleties and nuances of great coffee. It fosters whatever community of javaphiles you’re a part of. Most of all, it’s enjoyable, which is the entire point of coffee. You can chair the session yourself, or you can reach out to more experienced “Master Tasters,” which is totally a thing. These are usually cafe owners and/or employees whose experience is invaluable, but not a requirement. If you can, use multiple burr grinders (we don’t recommend blade grinders) so that you can grind each different coffee in a clean one. Grind the beans immediately before your fellow tasters arrive, or as they’re arriving, leaving as little time as possible between grinding and tasting. Set up enough hot water for all the cups you’ll be making. We recommend electric gooseneck kettles for this, as the exact temperature (205 degrees Fahrenheit, ideally) can be monitored and maintained throughout the cupping. Arrange tasting “stations” for each guest (and yourself) with enough cups, saucers and spoons for everyone to have a clean cup for each coffee. Also, each station should have a bowl in which to dispose of grounds. Have small containers (such as dipping bowls) filled with each different coffee at each station, arranged in the order in which they’ll be tasted so that everyone is tasting the same thing at the same time. Tip: A good idea is to make cards describing the coffees being tasted, with space for guests to record which ones they like best and make brief notes. 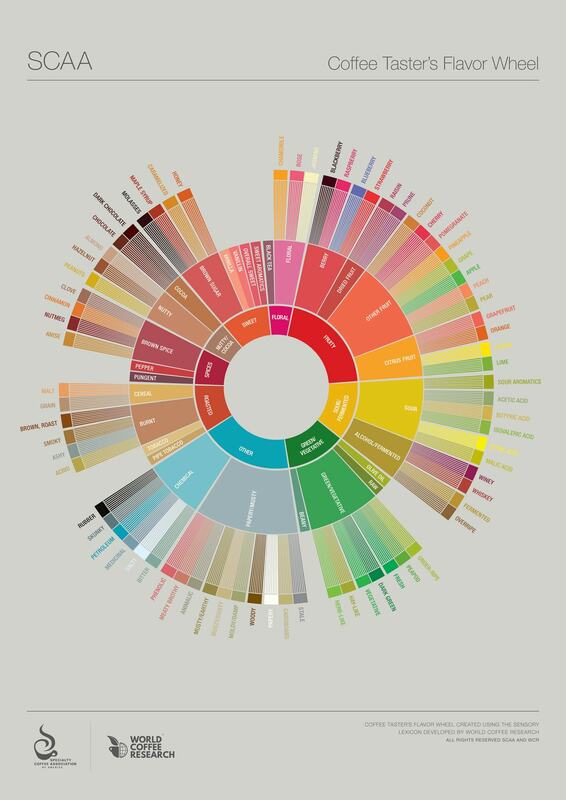 Also, visit SCAA.org for a detailed “flavor wheel.” This handy chart has one important purpose: to promote a standardized vocabulary through which everyone can share their impressions. Decent coffee is almost always good, but it helps to know if it’s good in a leguminous way or a medicinal way. Or both. Or whatever. Once everything is set up, the coffee is ground, and the guests have arrived, simply guide the proceedings. Say a few words about what everyone will be tasting, and invite everyone to smell the first set of grounds. Encourage discussion of what each person smells- no right or wrong answers. Next, have everyone pour the first grounds into their cups. Come around with the hot water, and pour just enough to cover the grounds at first, then let a minute elapse for the “bloom.” Next, come around again and fill each cup. Set a timer for 4 minutes. Once the timer goes off, invite everyone to smell the coffee. Encourage everyone to share their impressions and descriptions. Don’t be afraid to smell from the closest possible range, almost touching your nose to the liquid. At this point, it’s time to take the spoons and push the grounds that are floating on the surface out of the way, releasing yet another level of aroma for analysis. Through all three of these smelling stages (of the grounds, of the pour, and of the pour under the grounds), new levels of complexity will come through. Finally, it’s time to scoop all of the floating grounds off the surface and discard them into the bowls. Then, get a (clean) spoon full of coffee, and sip (slurp, really) slowly, allowing the coffee to move across the entire tongue to pick up every level of flavor. Savor it. Discuss it. Enjoy it- together. Repeat with each different coffee. Above all, remember that a cupping, like coffee, is first and foremost about pleasure and enjoyment. It’s not a competition of palates or a championship of pretentiousness. The purpose of a cupping is to learn, to share interpretations, and to widen your coffee horizons in the company of friends. With that in mind, no cupping can go wrong. How Often Should You Work On Your Palate? So how often should you work on developing your coffee palate? Well, the answer is as often as you can. The more that you can work on developing your palate, the faster it will develop. When you do follow these steps, you need to make sure you have adequate time to perform all the steps accurately in order for it to actually help you develop your palate. In time you will find that describing the different tastes of coffee becomes easier and easier making the process even faster than before. Ninja Coffee Bar vs Keurig: Pod or Pass? Are you a mad scientist with a need for range or a busy bee with a need for speed? We've put together this guide on Ninja Coffee Bar vs Keurig to help you find the right machine for you. Confused as to what exactly the difference is between a cafe au lait vs latte?? Or maybe you just want to know how to make them? Read on for our guide that covers both. If regular coffee strength and caffeine levels aren't cutting it anymore or you simply want to make a GOOD iced coffee at home, you should consider double brewing. Read our guide on how to double brew coffee to up your coffee game and put that extra pep in your step that we all know you need. Death Wish Coffee Review: World’s Strongest Coffee? For those of you constantly on the lookout for something to get you moving in the morning, you've probably come across Death Wish Coffee before. We decided to try it out and give you a Death Wish Coffee review. Are you a fan of beautifully crafted coffee but don't have time for ALL the steps needed for alternative brewing methods? Try these quick and easy instant coffee recipes to finally combine efficiency with taste. Don't have enough time in the morning to put all the effort into manual coffee-brewing methods to make your perfect cup of java? If so, read on. We've put together a guide with the 10 best Keurig coffee makers with some of our recommendations and things you should know before you pick an automated brewer. The Home Barista Coffee Course 14-lesson video course about brewing consistently amazing coffee at home. Stream or download the entire course to learn how to make coffee as good as your local barista for a fraction of the cost. © 2019 Ace Media, LLC. All rights reserved. Privacy & Terms. Feel free to contact us and find out about advertising.